London: Faber & Faber, 2004. N.B. Very slightly annotated by reviewer. . First Edition. Cloth. Very Good/Very Good. 8vo - over 7¾" - 9¾" tall. At a family reunion in Wales several years ago, the prize-winning poet Owen Sheers stumbled across the mesmerizing story of his great-great-uncle Arthur Cripps, a mysterious figure who turned from poetry to missionary work in Africa and ultimately became a shamanlike figure, ministering to the locals. Arthur Cripps left his native England in a ship set for southern Rhodesia in 1900. During his time as a missionary in the British colony, Cripps became passionate about indigenous ways, leaving him ostracized from the largely racist, conservative European minority. Railing against colonial injustice, Cripps became a hero to the native population. He chose to exile himself from the Anglican church, factions of which branded him a heretic and burned down his churches. All the while he hid the soul-racking secret of what had driven him from England into the heart of Africa. 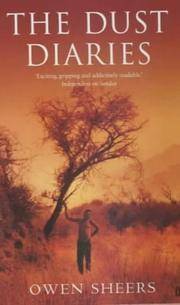 The Dust Diaries is the haunting record of Sheers's all-consuming attempt to piece together the luminous fragments of Arthur Cripps's remarkable life, and to understand the mystery of why he abandoned England for life in the African veldt - a journey that takes Sheers from the genteel reading rooms of Oxford University's libraries to the parched landscape of contemporary Zimbabwe. Refracting Cripps's life through the prism of his own vivid imagination, Sheers illuminates the devastating effects of power, the potent effects of grace, and the legacy of an extraordinary life.